This booklet gives you an explanation of the Taoist Cosmology (North Star and Big Dipper, Nine Sacred Mountains, Nine Palaces, Darkness Practice, Big Dipper Practice and Nine Palace Practices) with a step-by-step Afternoon or Evening Meditation. There are 58 pages with over 46 color illustrations and images. Kan and Li literally means water and fire. The Chinese formula Siaow Kan Li (Yin and Yang Mixed) literally steams the sexual energy (Ching) into life force energy (Chi) in order to feed the soul or energy body. The formulas in the Lesser Enlightenment help to give birth to the soul body, an awakening of that part of yourself, which is free from environmental and karmic conditioning. The birth of the soul is not metaphor. It is an actual process of converting energy into a subtle body. 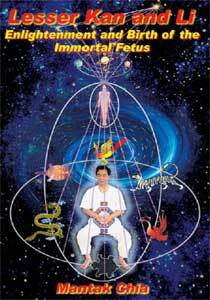 The newborn soul matures in relation to your energy skills. If you were to die, the energy gathered in the soul body will not simply dissipate buy carry on. The Lesser Enlightenment of Kan and Li leads to the first steps of overcoming reincarnation. Developing the soul body is the preparation for the growth of the Spirit Body in the Greater Enlightenment of Kan and Li. You will start to experience the mystery. "Begin it now." As Goethe said, "Boldness has genius, power and magic in it."